‘Well, Your Honour, it was 4 weeks ago when I promised the defendants some recipes from a now-distant trip to Barbados’. ‘Do you forgive the accused? So here begins this tale of three dishes, made in under an hour and arguably the best of Barbados food sampler I had, but I will start at the very beginning. 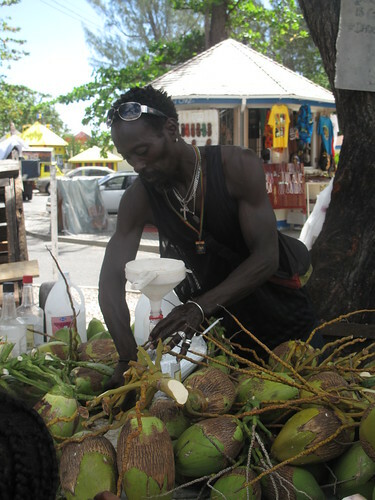 Most all Barbadians, it turns out, are willing to teach visitors how to cook Bajan-style. 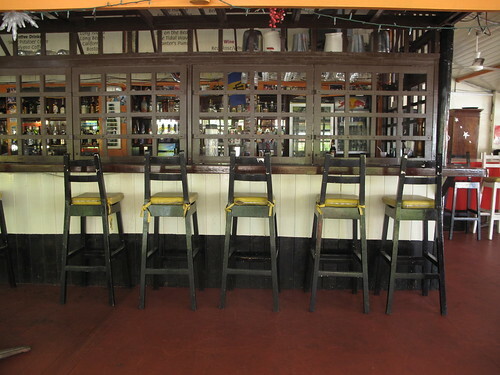 Visit the kitchen of Sweet Potatoes restaurant for one of its one-, two- or three-day classes, and you’ll leave with a bottle of Bajan spices and a recipe for (among other traditional dishes) Souse and Pudding, which is grated sweet potato stuffed into pig intestine and topped with meat from the pig’s head and feet. It tastes better than it sounds. Really. 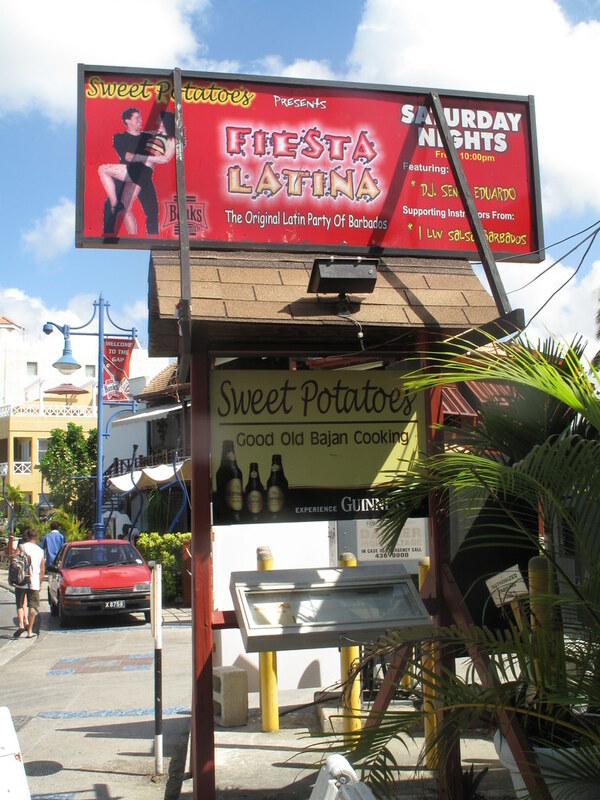 Sweet Potatoes St. Lawrence Gap. (246) 420-7668. Classes are taught from 3 to 5 p.m. on Wednesdays and Fridays, and from 9 to 11 a.m. on Saturdays. Cost is $35 for one day, $55 for two days and $85 for all three days. Call ahead to book. After serious travel jigsawing, I settled on Saturday morning being the best day as we arrived on the Wednesday and were billed to leave the Wednesday following, plus Friday was out with us attending the Wedding rehearsal dinner. So Saturday it was. For some reason, which may include the fact that the classes are not a regular offering, it took numerous phone calls and a few days to fix Saturday as the day. Eventually, I did and waited excitedly. We got there early, the entire family. 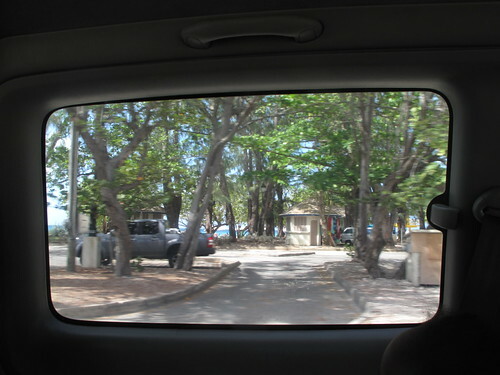 We hung out, and I spotted some almond trees, which took me back……….way back. 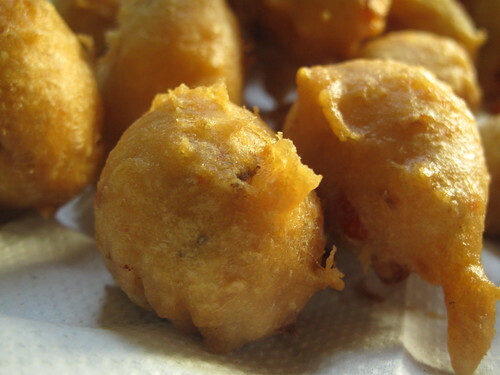 In the south of Nigeria, where I grew up, we call these Ebelebo. 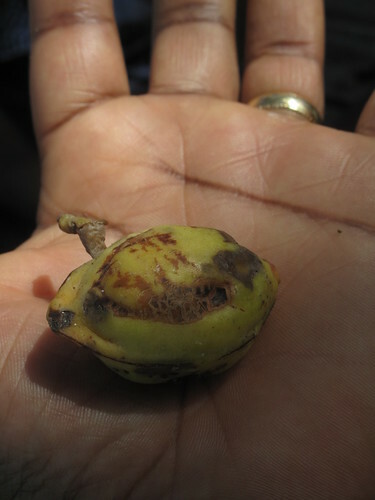 The fruit start out green and ripen to a bright yellow, at which point they are plucked of, washed (or cleaned with two palms) and with eager teeth, the fruit is eaten till the hard, fibrous core is reached. If more adventure is required, a heavy piece of rock is sought out, the nut is cracked and a fresh ‘almond’ nut is revealed. This is also eaten. Oh the days of youth. Long gone but not forgotten. Eventually it was time and even though I was to be the only one going to be cooking, my girls had hoped they could watch but that wasn’t to be – they weren’t allowed in the kitchen, for very good reasons, such as kitchens are dangerous places, even to some grown-ups! So while I cooked, they lounged and dozed on the beachfront with their Papa and brother. I was met in the restaurant by a very nice, elderly lady. She led me through the restaurant, to the back. In the warmth of the kitchen, I proceeded to put my bag on the floor, at which point the lady snatched it out of my hand saying ‘Don’t put your bag on the floor girl, you be poor’! I smiled, I was home! The first thing we made, while I hastily adjusted my camera trying to get the white balance and everything else in top condition (it didn’t work). 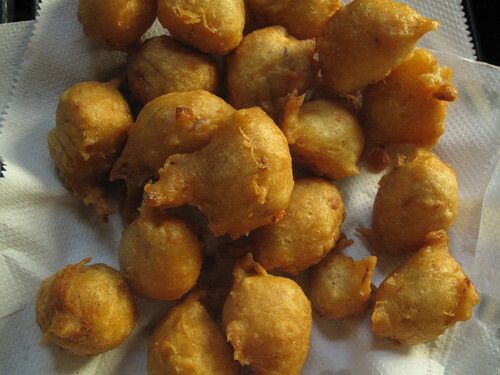 We started with salt fish cakes, fish balls, seasoned and mixed with flour, baking powder and water and deep-fried to produce golden fishy, doughy balls. From the days of slavery, salt fish was imported into the Caribbean, serving as the main source of protein for domestic staff and slaves. Currently, most of the salt fish in the Caribbean comes from Canada, and I’m not at all surprised at all. 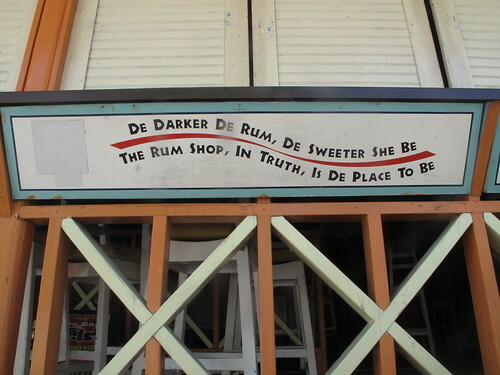 I knew there had to be serious links with Canada while we were in Barbados. Why? 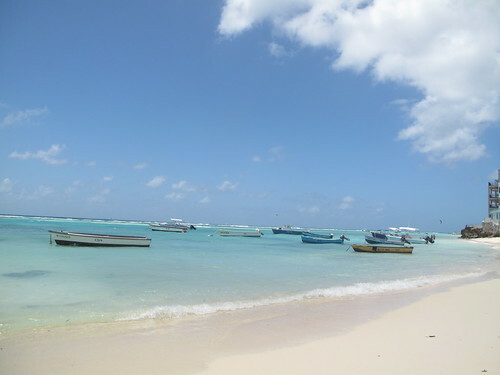 Well, 3 in 5 tourists we spoke with were Canadian and there are a couple of Canadian banks in Barbados, as there are not that many banks, I consider 2 a serious number! 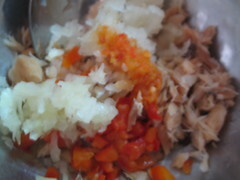 But salt fish hasn’t always been popular, if available. It wasn’t till after the 2nd World war, when food became scarce that it grew into favour with other ‘classes’, other than the lower echelons. 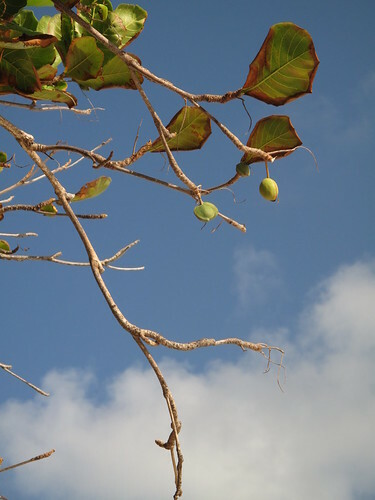 Today, it is a popular cocktail snack, the national food of Jamaica (With ackee) and is enjoyed by many. These were the second fish cakes I had and they were awesome! I would make them again at home if I could! 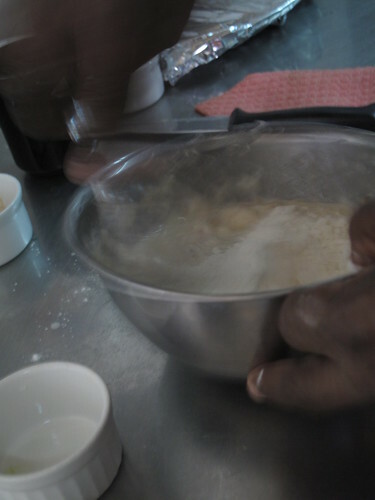 To make the cakes, we began with flaked salt fish (which had been soaked to rid it of salt, then flaked). This went in a large bowl with chopped red paprika/bell peppers, onions, some salt and Bajan seasoning. To this, we added some water, yes water, and then all-purpose flour with a pinch of salt and baking powder and then gave it a good stir till the mixture was thick, much thicker than a pancake mix, each spoonful dropped off in a glob! All this while, the deep-fryer was on. 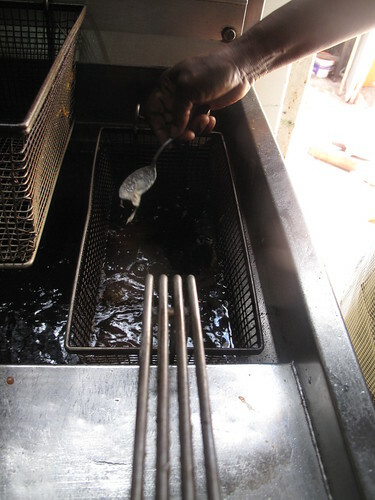 We then proceeded to the hot oil and then the lady, removed the tablespoon she was going to use as a scoop for the balls and dipped it into the oil. 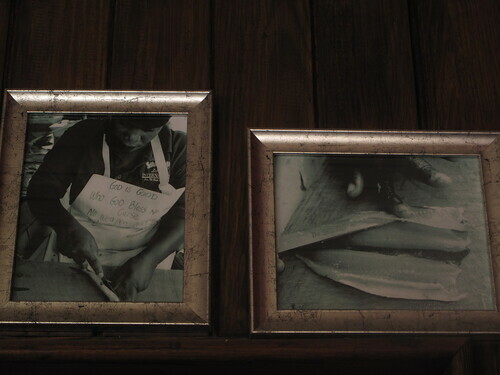 This she said eased the journey of the salt fish dough from bowl to fryer. She repeated this act between balls. 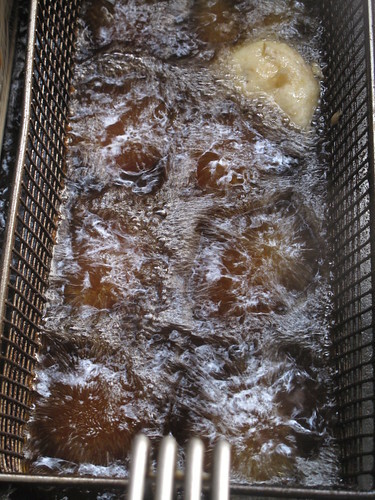 Eventually, the balls cooked, turning golden, fished out and ready for sampling. I’ll say this again, I thoroughly enjoyed the slightly chewy, not over-powering fish taste of these balls. 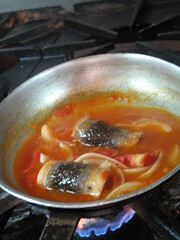 They were very well spiced without being peppery or causing a flavour wipe-out. There was enough to pack up and share with the rest of my famille. 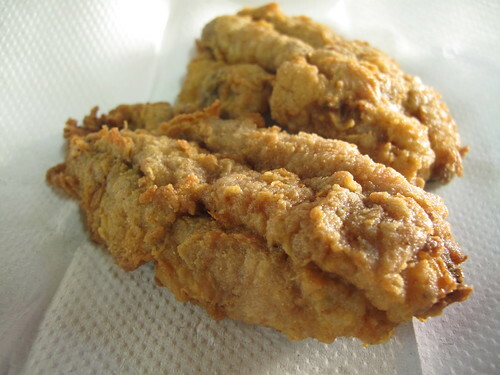 We proceeded to make battered flying fish. 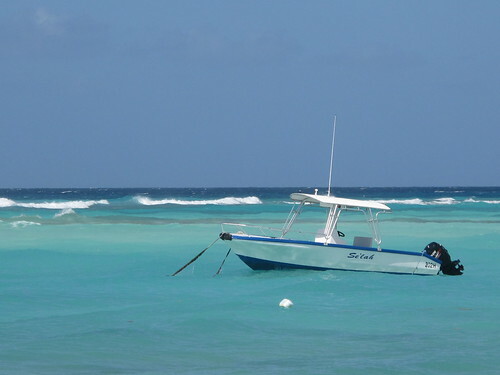 Barbados is known as the ‘Land of the Flying Fish’. Need I say more. 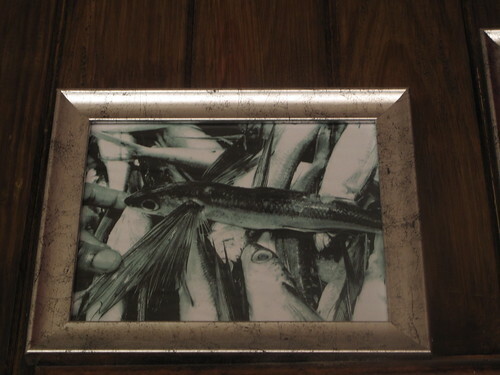 These fish start out with super long fins. 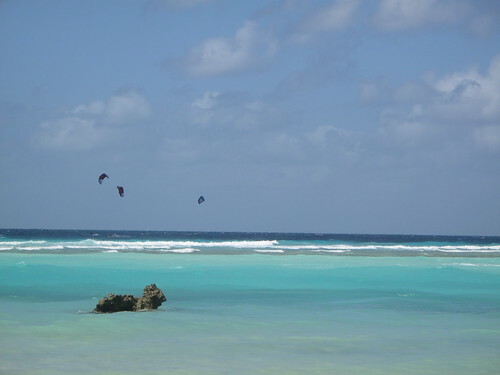 Though we didn’t witness this, some say the fish leap in and out of water, often alongside boats….appearing to ‘fly’. They are caught (especially between December and June), boned and filleted and prepared in a variety of ways, two of which I share today. 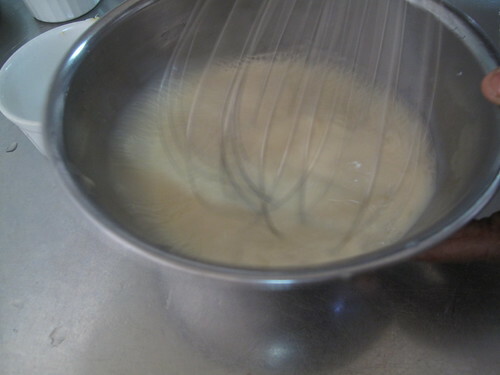 The batter was the first thing to be made. 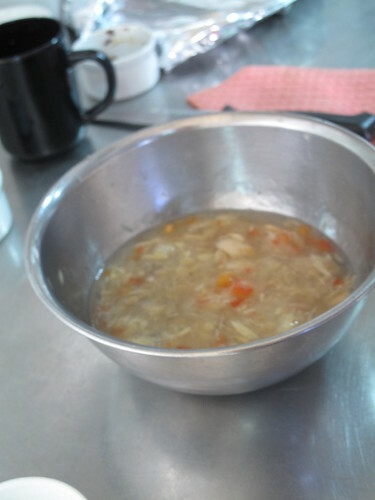 It consisted of an egg, 4 tablespoons of milk (single cream can also be used) and some seasoning. This was whisked well and then the mix for the coating was made – a quarter cup of plain/all-purpose flour mixed with 4 tablespoons of dry breadcrumbs, half a teaspoon of baking powder and some seasoning. 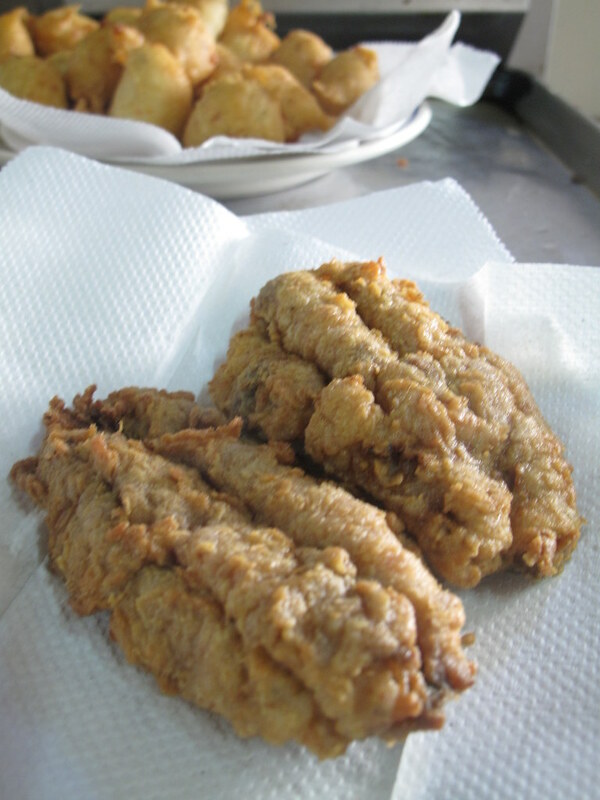 The skinned fishfillet , washed, dried and sprinkled with some seasoning was first dipped in the flour and then in the batter, before being deep-fried. Again, once it took on the coat of gold, it came out and rested for a few minutes. I took this home to try later and it was AMAZING. The batter was superb and the fact that the breadcrumbs went in the flour gave it a thick but not crumbly coating, which ended up as a cross between pure batter and fish-finger crumb! 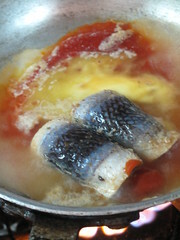 And last but not least by any measure was the steamed flying fish fillets or rolls! 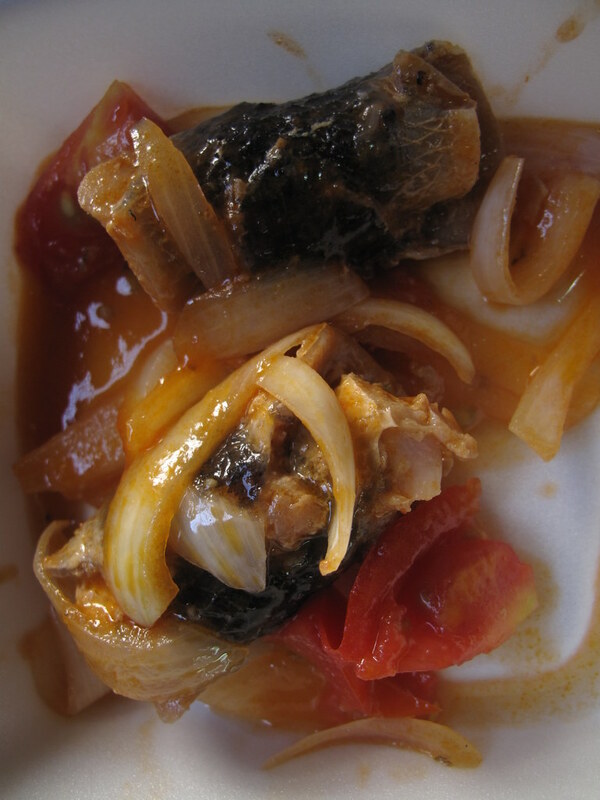 This fish is one-part of the famous Bajan national dish – Flying Fish and Coucou! 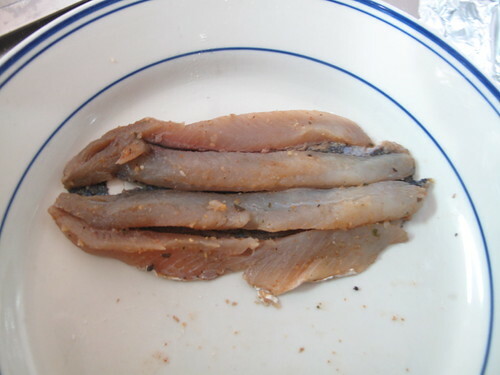 These fillets were not skinned. The lady quickly seasoned them and rolled them up. To prevent them from unfurling in style during the short steam once rolled up, she gave each roll a thump/whack with the palm of her hand, flattening it out a bit and effectively setting it and negating the need for a toothpick to secure it! 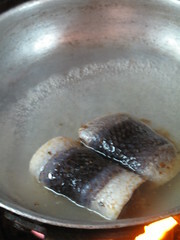 She placed both fillets in a pan filled with water which had been brought to a light boil. To the pan, she added a know of butter, some ketchup (tomato puree can also be used), chunky chopped tomatoes and onion slices and finished off with a pinch of salt and sprinklings of dried thyme and marjoram. 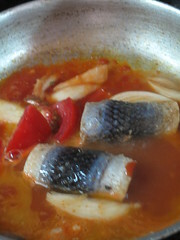 As the fish cooked, she stirred around the rolls, tasting, adjusting and just moving things around, scooping some of the sauce onto the fish till, a few minutes later it was all cooked. Again, this went home with us and the little taste I had of it was great. What Ir eally enjoyed was the tip about hitting the rolls with your palm to prevent them from opening up during cooking. The class lasted under an hour, for which I forked out just over $30 USD. In my opinion it was well pro-rated as the advertised 2 hour class cost $65 USD. And though I didn’t leave with any seasonings, I did enjoy my time spent in the Bajan kitchen, cooking, learning and experiencing a bit of authentic Caribbean food. I would do it all over again. 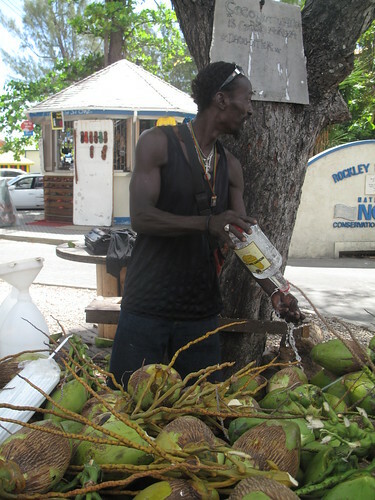 The morning ended with a second drink of coconut water. Now, to be honest, coconut water and milk are night and day. Very different. While the water, is warm and mild tasting, coconut milk is not. Saying that, I enjoyed drinking warm coconut water on a warm day. Considered a health drink, good for body and bodily functions, I had myself some. Once opened, I could drink from my ‘rose’ coconut. While I drank, customers came up to buy the water, by the litre. When I was done, all ready to walk away, the seller stopped me, letting me know that I was only half done. 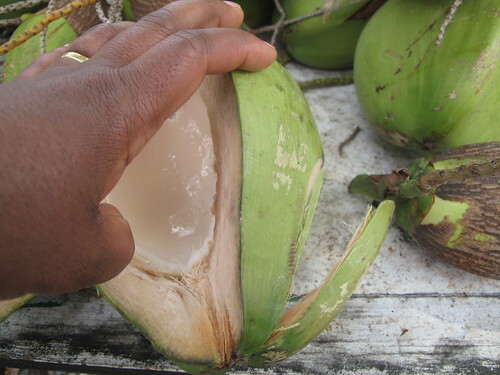 See, usually, the coconut is open once the water is drunk and the young flesh, eaten with a scoop slashed out from the side. I enjoyed this, very much. New to me, and tasty too. 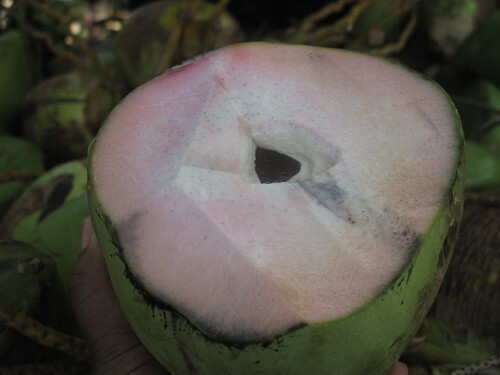 It had the flavour of the coconut, albeit it softer and less pronounced but the texture of custard, rather than the hard crunch of the mature coconut. What an experience. 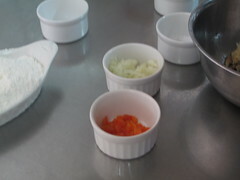 And there you have it, in one post, my Bajan cooking class. Thanks for your patience and lots of love. 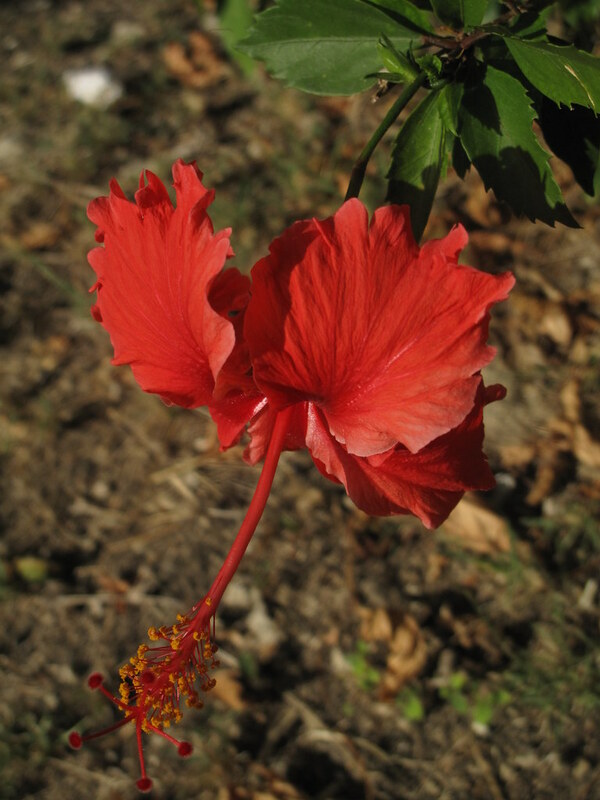 Thank God too for unbroken promises – accept this Hibiscus flower as a token of – love, kindness, missing-you and whatever else. Leading the defendants to say? We forgive you? Or we don’t. What will it be?